Katheryn is now out of stock and retired. 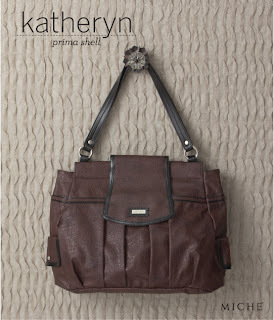 Its deep hot chocolate color gives the Miche's Katheryn Shell for Prima Bags a richness that immediately catches your eye. But it's the details of this Shell that make it an absolute must-have for your collection deep classic pleating construction; over-the-top strap closure, convenient snap-close side pockets with chic rivet accents; black faux leather detailing in all the right places. Katheryn is a feast for the eyes that will quickly become your favorite all-occasion take-along accessory.